One Sunday morning, on my way to church, I could not leave my automobile until I finished listening to, “We Must Praise,” the new single from Detroiter J Moss. 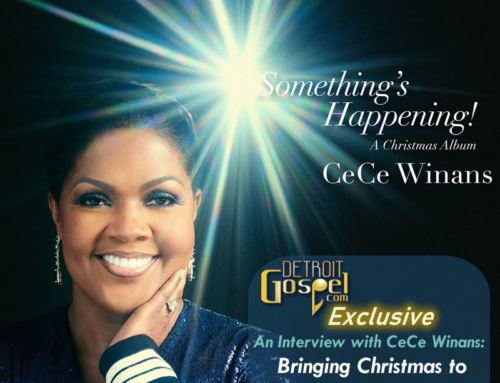 The song showcased a more personal side of 1/3 of the hard-hitting PAJAM production team, known for crafting hits for such artists as Karen Clark-Sheard, Kelly Price, Dawkins and Dawkins, Boys II Men, N Sync, and the Mighty Clouds of Joy. J Moss along with Paul Allen and Walter Kearney formed PAJAM, a production house, with the intent of writing and producing great music. Paul Allen was working with Michael Powell (producer for Anita Baker and Oleta Adams). Walt Kearney was working as a commercial producer, and J was perfecting his talent as a song writer and musician. J shared that PAJAM is successful because, “everyone stays out of each other’s lanes,” and the brothers respect what each brings to the table. Walter handles the business aspects of PAJAM, Paul handles the engineering work, and J handles songwriting. Everyone knows the success of PAJAM, but J Moss remembers the early days when PAJAM would, “work for free in order to get their production team’s name out in the industry.” J recalled that when PAJAM submitted songs for Karen Clark Sheard’s first solo release, the industry thought they weren’t ready. However, PAJAM rose to the occasion and produced the classic, “Praise Festival,” along with other hits on the “Finally Karen” CD. Even when PAJAM submitted the song “You Should Have Told Me,” for Kelly Price, her CD was finished, but Kelly loved the song so much that she paid for the song to be added to her CD. With his first major label CD, “The J Moss Project,” resting in the top 10 of the gospel music charts for the past 9 months and crossing over to the secular market, J attributes the success to “favor and blessing of God” and God’s stamp of approval on his season. He also thanks his record label, GospoCentric, for their “untiring efforts to support the project,” along with the PAJAM staff for keeping him going. The songs on “The J Moss Project” are songs which are from J’s heart. When recording the project he didn’t use a lead sheet, he would walk into the studio and just allow God to speak through him. During the session the PAJAM staff would allow him to sing, cry, and hear from God with a brotherly understanding. The results created such great worship songs as “Unto Thee” and “Me Again.” One of the most popular tracks on the CD is “Livin’ 4,” a song written before work started on “The J Moss Project.” Originally written when the brothers in PAJAM were single, the song had a different meaning for them then, than it does now that they are married. The song touches a reality of life being saved, having to deal with real desires, and making a life-impacting decision. J Moss comes from a rich lineage of gospel artists. His parents Bill and Essie Moss traveled the country singing such gospel hits as “Everything Will Be Alright” and “I’ve Already Been To The Water.” J’s parents would take J on the road; his dad would teach him stagemanship, while his mother instilled the spiritual side of performing. At an early age J, along with his brother, Bill Moss, Jr., formed the Moss Brothers and had a hit single, “Tree of Life.” J’s aunt was Dr. Mattie Moss-Clark and his first cousins are the Clark Sisters. When J went on the road with the Clark Sisters singing background, he was constantly amazed at how audiences would respond to his cousins when they performed live. Currently J and his family are members of Greater Emmanuel COGIC, where the pastor is Superintendent J. Drew Sheard. The church is overflowing with talent from his family including cousins, first lady Karen Clark-Sheard, label-mate Dorinda Clark-Cole, and teen gospel sensation Kierra “Kiki” Sheard. J thanks pastor Sheard for allowing all the artists the freedom to be themselves musically, but also being strong enough to pastor them and check them if they get out of line. J also loves working with his family members. He’s mentoring his cousin, J Drew Sheard, II (part of the LT Production Crew); niece, Erin, is a backup singer for him; and he’s done production work on his cousins Karen, Dorinda, and Kierra’s projects. J laughs when asked how does he show the divas of gospel “runs” when producing them in the studio. He says that his cousins respect him and listen to what he advises them. However, J proclaims, “I can ‘out run’ even the queen of ‘runs,’” Karen Clark- Sheard. As we come to the close of the interview, I asked J if PAJAM had an opportunity to remake, “We Are The World,” who would he invite to participate. He responded by saying such artists as Tonex, Kirk Franklin, Deitrick Haddon, Karen Clark-Sheard, Dorinda Clark-Cole, N Sync, Boys II Men, Kelly Price and other artists that record labels would not normally allow to record together. The J Moss Project has been in the making for several years and for those that have experienced this recording, it’s been well worth the wait. 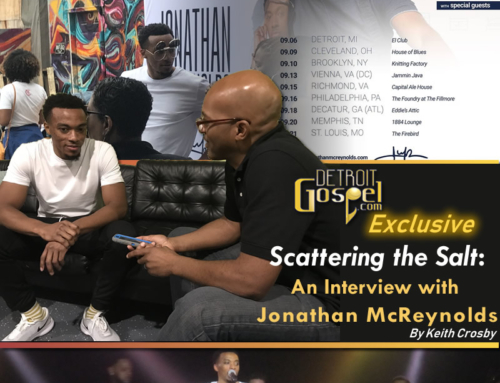 Detroit Gospel.com thanks J for taking time out of his busy schedule to share with us and we anticipate much more to come from this dynamic music minister.